Estos son los cambios a los chamanes actualizados a fecha 16 de febrero. Ancestral Guidance cooldown reduced to 2 minutes, down from 3 minutes. Nature's Guardian: Whenever a damaging attack brings you below 30% health, your maximum health is increased by 25% for 10 sec (up from 15%) and your threat level towards the attacker is reduced. 30 second cooldown. Astral Shift: Seek haven by shifting partially into the elemental planes, reducing damage taken by 50% but also all damage and healing done by 30% (down from 50%), for 6 sec. Totemic Restoration: When a totem is replaced or destroyed before its duration expires naturally, its cooldown is reduced in proportion to the lost duration, up to a maximum of 50% of the full cooldown. Ancestral Swiftness: Passively increases spell and melee haste by 5%. When activated, your next Nature spell with a base casting time less than 10 sec. becomes an instant cast spell. Tier 6 Talents: All unknown at the moment. NEW - Burning Wrath: Fiery elemental energy emanates from the Shaman, empowering all nearby party and raid members and increasing their spell power by 10%. NEW - Grace of Air: Empowering winds swirl around the Shaman, granting all nearby party and raid members 5 Mastery. Earth Shock: Instantly shocks the target with concussive force, causing 1,030 Nature damage and applying the Weakened Blows effect. Weakened Blows: Demoralizes the target, reducing their physical damage dealt by 10% for 30 sec sec. Flametongue Weapon: Imbue the Shaman's weapon with fire, increasing magical damage done by 7% (up from 5%). Each hit causes 99 to 305 additional Fire damage, based on the speed of the weapon. Slower weapons cause more fire damage per swing. Lasts 30 minutes. Flame Shock: Instantly sears the target with fire, causing 586 Fire damage immediately and 1,320 Fire damage over 24 sec (up from 18). Ghost Wolf: This ability is now instant, but no longer reduces the effect of movement impairing effects. Wind Shear: Disrupts the target's concentration with a burst of wind, interrupting spellcasting and preventing any spell in that school from being cast for 3 sec (up from 2). Also lowers your threat, making the enemy less likely to attack you. 12 second cooldown (down from 15). Cleanse Spirit: Removes all (up from 1) Curse effects from a friendly target. 8 second cooldown (up from none). Healing Stream Totem: Summons a Healing Stream Totem with 5 health at the feet of the caster for 1 min that heals the most injured party or raid member within X yards for 81 every 2 sec. Earth Elemental Totem: Summons an elemental totem that calls forth a Greater Earth Elemental to protect the caster and his allies. Lasts 1 min (down from 2). 5 minute cooldown (down from 10). Fire Elemental Totem: Summons an elemental totem that calls forth a Greater Fire Elemental to rain destruction on the caster's enemies. Lasts 1 min (down from 2). 5 minute cooldown (down from 10). NEW - Ascendance: The Shaman surrenders his physical form to the power of the elements, transforming into a being of raw elemental energy for 15 sec. Required Level 87. 3 minute cooldown. Elemental: While in the form of a Flame Ascendant, Lava Burst has no cooldown and Chain Lightning is empowered to become Lava Beam. Enhancement: While in the form of an Air Ascendant, auto-attacks and Stormstrike deal pure Nature damage and have a 30-yard range. Restoration: While in the form of a Water Ascendant, all healing done is duplicated and distributed evenly among nearby allies. Shamanism no longer works with Lava Burst. Elemental Fury: Increases the critical strike damage bonus of your Searing and Magma Totems and your Fire, Frost, and Nature spells by 50% (down from 100%), and removes the cooldown from your Chain Lightning spell. NEW - Elemental Precision: Grants spell hit rating equal to any Spirit gained from items or effects. Stormstrike now does 150% weapon damage, down from 225%. Lava Lash: You charge your off-hand weapon with lava, instantly dealing 130% (down from 260%) of that weapon's damage to an enemy target and spreading your Flame Shock from the target to up to four enemies within 12 yards. Damage is increased by 40% if your off-hand weapon is enchanted with Flametongue. Searing Flames: Now includes - Your Lava Lash ability will consume your Searing Flames, dealing 20% increased damage for each application on the target. Purification: Increases the effectiveness of your healing spells by 25%, and the healing done by your Water totems by an additional 50%. No longer reduces the casting time of your Healing Wave and Greater Healing Wave spells. Purify Spirit: Cleanse Spirit now includes Magic effects. Earth Shield: Protects the target with an earthen shield, increasing the effectiveness of Shaman healing spells on that target by 20%, and causing attacks to heal the shielded target for 1416. This effect can only occur once every few seconds. 9 charges. Lasts 10 min. Earth Shield can only be placed on one target at a time and only one Elemental Shield can be active on a target at a time. Earthliving Weapon: Imbue the Shaman's weapon with earthen life. Increases spell healing by 855 and gives each heal a 20% chance to trigger the Earthliving effect on the target, healing an additional 2,348 over 12 sec. Heals on targets below 35% of maximum health will always trigger this effect. Lasts 30 minutes. Mana Tide Totem: Summons a Mana Tide Totem with 10% of the caster's health at the feet of the caster for 16 sec (up from 12). Party and raid members within 40 yards of the totem gain 200% of the caster's Spirit (excluding short-duration Spirit bonuses). Nuevos y jugosos cambios para todas las clases previstos en MoP, que todavía no son definitivos, ni mucho menos. De hecho, a nosotros aún nos faltan los talentos de nivel 90. Se pueden consultar los árboles de talentos en este enlace. Cómo ya comenté anteriormente cuando se anunció la salida de MoP, los talentos dejan de existir tal como los hemos conocido hasta ahora, y pasamos a tener un árbol totalmente distinto. Cada 15 niveles, podemos escoger una muy interesante habilidad entre tres disponibles, que se suman a las que vamos obteniendo por nuestra propia clase y especialización de talentos. Han cambiado ligeramente desde que se anunció este árbol en la Blizzcon (ver este post). Tier 15, o tier de la supervivencia (anteriormente, tier del CC). Nature's Guardian: whenever a damaging attack brings you below 30% health, your maximun health is increased by 15% 25% for 10 sec and your threat level against the attacker is reduced. 30 sec cooldown. Stone Bulwark Totem: summons an earth totem with 5 health at the feet of the caster for 30 sec that grants the caster a shield absorbing 2649 damage 359 damage, and refreshes the shield every 5 sec and up to an additional 120 every 5 sec thereafter. Tres diferentes CD's de supervivencia a escoger según la situación. Muy bienvenido, dado que hasta ahora solo teníamos un tótem+glifo que absorbía sobre 16k para evitar daño. Aunque podáis pensar que esto solo sirve para PvP, este tipo de CD's son muy útiles en raid, especialmente en hard modes. Tier 30, o tier del CC (anteriormente, tier de la supervivencia). Frozen Power: your Frost Shock now also roots the target in ice for 5 sec. Windwalk Totem: summons an air totem with 5 health at the feet of the caster for 6 sec, granting raid members within 30 yards immunity to movement-impairing effects (se elimina el Repulsion Totem). Tier dedicado al CC. Quizás más útil en PvP, pero no puede descartarse que sea necesario en PvE también. Call of the Elements: when activated, inmediatly finishes the cooldown of all totems. Totemic Restoration: If a totem is replaced or destroyed before its duration expires naturally, its cooldown is reduced in proportion to the lost duration, up to a maximum of the 50% of the full duration. Este tier está dedicado a aumentar la utilidad de los tótems, reduciendo su CD, aumentando su supervivencia o permitiéndonos ahorrar maná si tenemos que reubicarlos. Elemental Mastery: when activated, your next Lightning Bolt, Chain Lightning or Lava Burst becomes an instant cast spell. In addition, your Fire, Frost and Nature damage is increased by 15% and you gain 20% spell haste for 15 sec Calls upon elemental forces, empowering you with 30% haste for 20 sec. Ancestral Swiftness: passively increases spell and melee haste by 5%. When activated, your next nature spell with a base casting time less than 10 sec becomes instant (anteriormente llamado Nature's Swiftness). Los talentos son compartidos por las 3 ramas del chamán, así que todos ellos pueden ser útiles siendo DPS o siendo healer. Tier 75, o tier del healing (anteriormente, tier de los cooldowns). Healing Tide Totem: summons a water totem with 5 10% of the caster's health at the feet of the caster for 10 sec, healing the 5 most injured raid members within 40 yd for 1060 every 2 sec. The Healing Tide Totem pulses every 2 sec, healing the 5 most injured members within 40 yd for 3179. Ancestral Guidance: when you deal damage or healing for the next 10 seconds, 40% of that amount is copied as healing to a nearby injured ally. Las clases DPS también necesitan cooldowns de healing para apoyar. En una raid son muchas las ocasiones en que se necesitaría un cooldown extra para ayudar a la superviencia, y este tier nos ayudaría. Tier 90: en desarrollo para nuestra clase. Nos falta el que anteriormente era el Tier de PvP, así que es posible que el tier 90 esté dedicado a esto. Siguiendo con la línea anunciada, los tótems cobran un protagonismo diferente al que vienen teniendo hasta ahora. Es decir, adiós a los bufos estáticos, y hola a la utilidad. Un buen cambio, bajo mi punto de vista. 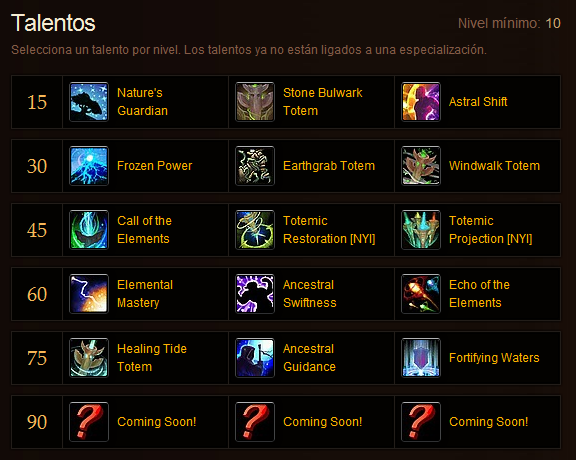 Earthliving Weapon (ahora incluye de serie el talento Blessing of the Eternals). La primera cosa que me está llamando la atención de esto, es que las otras ramas del chamán (elemental y enhancement) se quedan sin más curas que la Healing Rain, puesto que el resto de ellas son exclusivas de la rama restoration. No sé qué opinarán los compañeros DPS acerca de esto, pero sin duda les resta un poco de supervivencia especialmente en PvP. 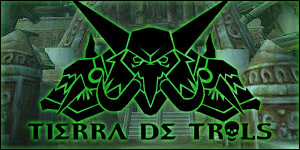 También pueden usar el Healing Stream Totem, que pasa a durar 1 minuto y a curar a los miembros más heridos de la raid, en lugar de sólamente a la propia party. En segundo lugar, me encantan los cambios a la combinación de Earth Shield y Earthliving Weapon con sus respectivos talentos, y a la Chain Heal con el bono de T12 de chami. Dichos beneficios pasan a ser pasivos, sin tener que escogerlos por talentos tal como se hace ahora. Además se añade un nuevo hechizo: Ascendance. Es común a las tres specs, pero con efectos diferentes para cada una de ellas. En el caso del healer, el efecto es que durante 15 segundos, todo el healing realizado se duplica y redistribuye por la raid. Un CD de raid muy interesante. En general, me está gustando la orientación que se le está dando al chamán de cara a MoP... aunque todos estos cambios no son definitivos, y aún nos faltan los talentos de nivel 90! Y lo de los dispels es coña? 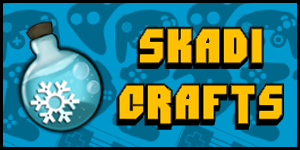 Ahora dispeleas todo de un click :) adios frost!! PD: Ahora el intelecto no dara mana pull asi que habra que cuidar mucho el mana y el espiritu, sobretodo al principio :) mas emocion y diversion!! Las otras ramas de chaman si tendrán una cura, 35% mana base, 1,5 segundos de casteo. La flash de toda la vida.